Water makes up about 70% of the planet’s surface, and approximately the same percentage of the human body. Water is everywhere. In order to survive, we need it to be available, and we need it to be clean. 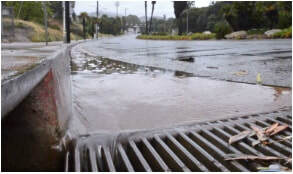 During rainstorms, we’ve all seen our streets fill with water as it moves over the asphalt surfaces and runs into storm drains. Here in the Bay Area, rain water runs from our roofs, driveways and streets, down storm drains, and into the San Francisco Bay. Not so bad, you might think, the Bay needs water to keep it filled, right? The truth is, as the water flows over rooftops and paved surfaces, it picks up all of the pollutants that have accumulated on them, including dirt and dust, gas and oil from cars, and pesticides and fertilizers from our gardens and lawns. All of these sediments and poisons end up in the San Francisco Bay, polluting it every time it rains. In a natural environment that water would stay on the land, filtering into the ground where it would be purified through plant roots and soil. A typical roof can catch thousands of gallons water every time there&apos;s a rainy day -- but we waste this valuable resource when we don’t create conditions that allow the water to remain on the land where it falls. And the pollutants carried in water that moves over impermeable surfaces before entering our waterways without first filtering through soil eventually affect the health of the entire local watershed and beyond - and our health as well. Fortunately, there are many ways that we can harvest the water that falls on our property, and keep it there for a more ecologically useful benefit. The first way is simply to remove non-permeable concrete surfaces so that water can percolate back into the soil and recharge the groundwater in a healthy way. In addition, the water that we keep out of the storm drains makes the soil we garden on more saturated, and most importantly reduces the need to add water. Another way is to harvest the “greywater” that comes out of our washing machines, bathtubs, and showers. ​Seasonal water storage is another way to harvest rainwater, and at Mariposa, we do seasonal water storage with a thing we like to call Dragonfly Ponds. Dragonfly Ponds are one of our favorite ways to harvest water. These water features capture the rain that falls on your roof by redirecting your downspout to deposit rainwater directly back into the ground rather than piping it out to the street. By retaining this water, Dragonfly Ponds create a water source for pollinators, particularly dragonflies. 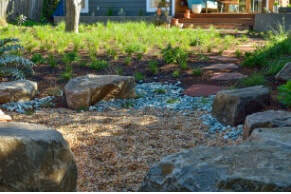 Rainwater is moved to a depression in the garden that’s filled with drain rock and decorative gravel. Water collects in the depression, the pit fills, and over the next few days the water drains back into the earth. This action of filling and draining, paired with grasses planted around the pond, creates the kind of muddy grassy conditions that dragonflies like to lay their eggs in. This dragonfly pond also serves as a fire pit. The benefits of a Dragonfly Pond include the addition of another layer of habitat to your garden, which in turn attracts flora and fauna that need it. In addition, the water that would have flushed pollution into the Bay is now recharging the groundwater table, and keeping water fresh and clean for the health of future generations. One challenge we face with every garden we create is, what can we build into the design to make sure the garden is not only beautiful, but also a regenerative place of abundant life? All life on earth needs food, shelter and water. We create food and shelter with the plants, but we also need to create spaces where water is accessible to birds, butterflies and bees, in order for them to build a home in your garden. All gardeners know that gardens need water to stay green and lush, but the past several years of on-again-off-again drought mean we&apos;ve had to think hard about the amount of water we use - and about how we can cut our water usage back. To make being water wise even more urgent, many municipalities have incentive-based and/or tiered-cost programs to encourage homeowners to reduce their water usage in the garden. It has become expensive to irrigate a garden, even on a small plot of land, using the more conventional irrigation systems. Plants need water to survive and to provide their environmental benefits of food and shelter for our native pollinators. At Mariposa, we discourage the trend toward limiting plant choices, creating arid gardens, and taking away the elements that create life in the garden; that is not the way to improve the health of the environment for plants, pollinators, OR humans. Transpiration, or the movement of water vapor from plants to the air to form clouds is essential to a healthy water cycle and to a healthy planet. Arid gardens may look modern and stylish and require little water, but a suburb filled with plots consisting of succulents and gravel will contribute to disruptions in the regional water cycle and can actually exacerbate drought conditions by making the planet hotter and drier! 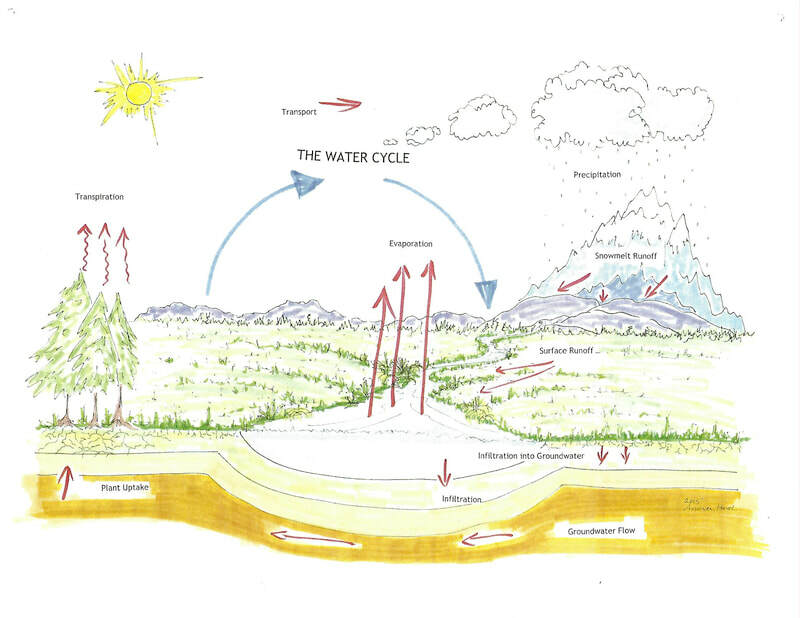 The water cycle needs transpiration of water vapor from plants to remain healthy. This winter we&apos;ve had a pretty good year for rain, but the specter of drought still hangs over the state of California, threatening to return. Using water wisely is always a good practice, no matter what the rain gods bring us, and the threat of drought is fundamentally related to the need to combat climate change with methods that promote sustainability and regenerativity. 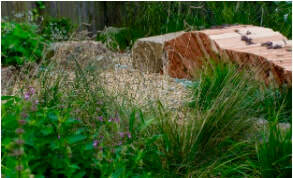 ​To paraphrase Hamlet, to irrigate or not to irrigate is not the question. Instead, we need to improve the source of the water that we use in our gardens. Water harvesting and greywater reuse are two of the primary ways to conserve by keeping water on your property instead of pulling more from the municipal tap. In the next two posts we&apos;ll show you how you can implement simple water harvesting and greywater techniques to continue to irrigate your garden, without using additional water bought from the city. Does your outdoor space give you joy? Does it allow you the opportunity to connect to the natural world? Or is it a source of worry, an expensive responsibility, a time-consuming chore? If you lean more toward the second feeling than the first, you&apos;re not alone. When we lead busy lives, spending time in the garden becomes a taxing chore. It can seem like there&apos;s always something to do, and not enough time to get it done. When we first meet our clients, many of them are overwhelmed by their outdoor spaces. Our goal is to help create enjoyable gardens for our clients, where they can relax and settle into a relationship with the natural world. A garden that hold life, such as a diverse array of butterflies, birds and bees, as well as a myriad of colorful plants that bloom year round, is one that can relax our minds, and calm our fears. Building gardens with an eye toward creating places that invite butterflies, birds and bees is commonly known these days as habitat gardening. Habitat gardening is about building and maintaining gardens by designing them through a way that creates serene spaces full of life, color, beautiful scents, and fresh air. As a bonus, this kind of garden requires less maintenance than traditional gardens because its design works with, rather than against, nature. Habitat gardening is also about taking a critical look at the standards of both the landscaping and agricultural industries and questioning what we as homeowners and garden makers can do to improve the environment, improve our health, and improve our communities by taking better care of our local environment and the living beings who depend on it. As a firm with thirty years of experience in designing, building, and maintaining gardens based on permaculture and ecological design principles, we&apos;ve learned how to create and sustain ecologically beneficial gardens that are also beautiful, inspiring places for human beings. 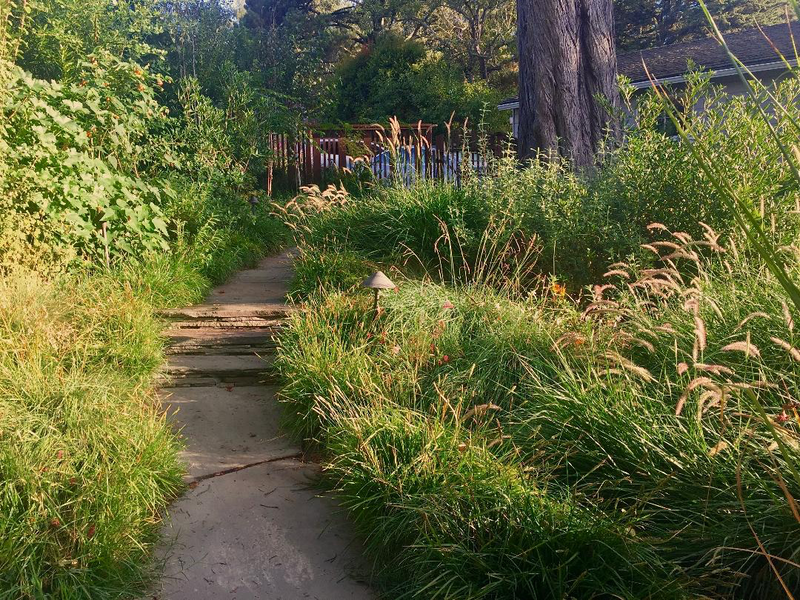 The pictures below show one of our client&apos;s gardens before and after; at Mariposa, we want everyone to have a space like this, that takes the stresses of the day away by providing a garden that is teeming with life, one that allows you to connect to the natural world. We want to share our expertise and knowledge of how to build ecologically inspired gardens with homeowners and members of the gardening community in this blog. Starting one garden at a time, we are working to restore and regenerate the health of our local and even our global environment. We’d love to start a conversation with readers, too; feel free to use the comments to tell us your opinions, experiences, learnings, successes and failures. Next up: How to design your garden with nature in mind. 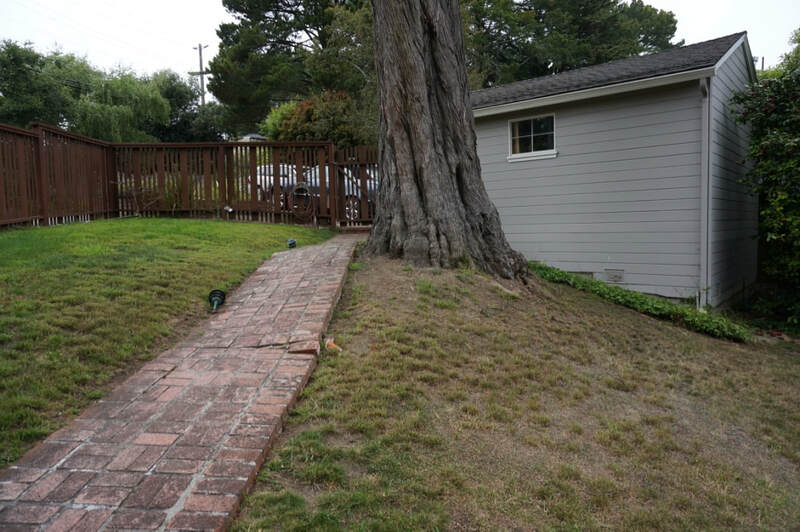 Before and after photos show the change from traditional to habitat garden at this Oakland home. March is a time of year in the Bay Area that sees a fluctuation in temperatures and in precipitation. This year, we were lucky in January to see so much rain, and then to have a warm and dry February. This brought out the blooms. When it comes to blooming, at Mariposa, we love to see as much late winter and early spring bloom as we can. Not only is it beautiful, after the cold grey days of December and January, but it is also important for our winged friends, the butterflies and the bees. Blooming flowers provide nectar and nourishment when the weather starts to get warm and the pollinators emerge from winter dormancy. Fuschia thymilfolia is an excellent garden performer. It keeps its flowers year round, and provides nectar to a host of pollinators, including bumblebees and hummingbirds. In addition, it does well in dry shade. Often, trying to find plants that work in dry shade is a gardener’s dilemma. 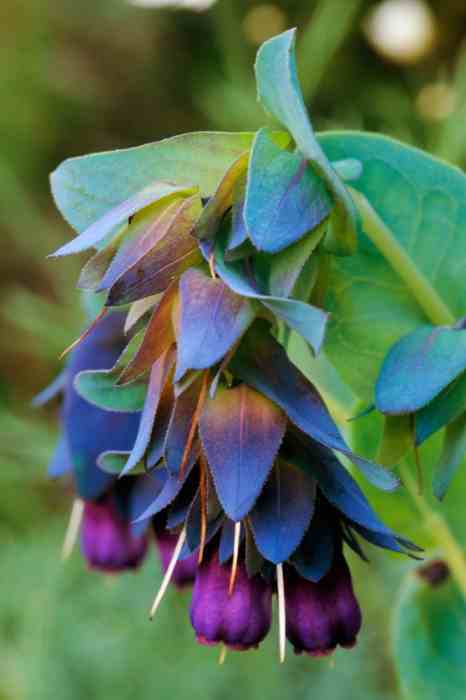 Cerinthe is a flower that will readily reseed itself in your garden. It’s lovely blue flowers are one of our first blooms of the year. 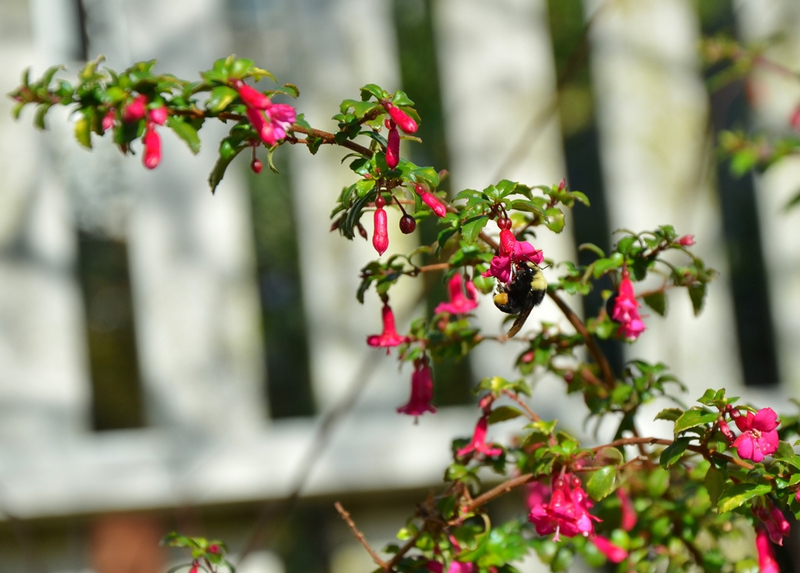 Bumblebees and honey bees will be glad that you’ve planted it, as it is blooming right when they start to actively forage again. 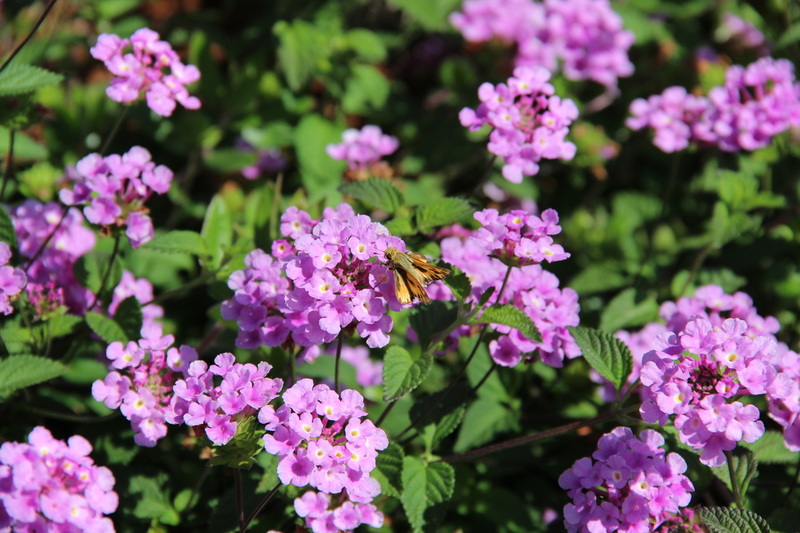 Lantana is blooming in my garden right now, however, I normally think of Lantana as a summer bloomer. Maybe it is the effects of the drought that has it blooming out of season. At any rate, it is blooming, and I have seen several bumblebees visiting during our warmer days in Late February. 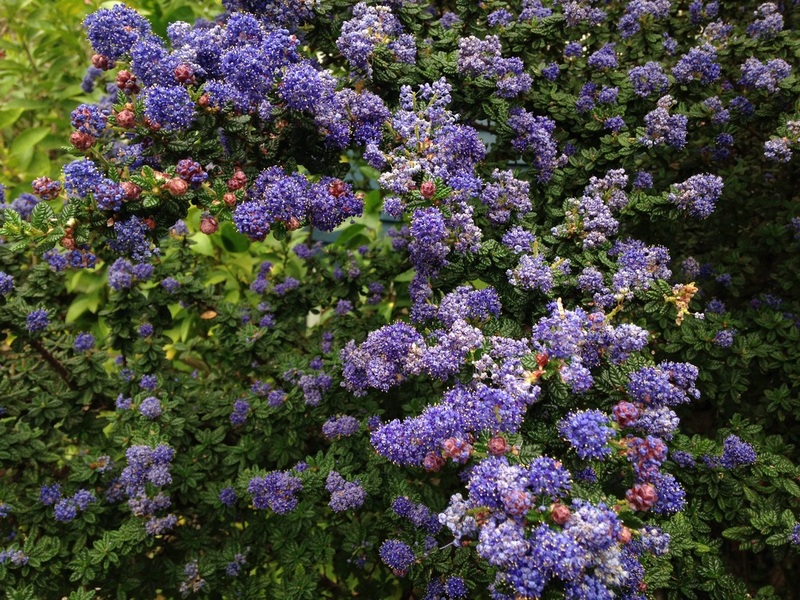 Ceanothus is one of my favorite late winter and early spring bloomers! It’s beautiful soft blue flowers make it a true gem in the garden. The heavenly and faint scent send me swooning every time I leave in the morning, as I have a full blooming Ceanothus ‘Ray Hartman’ blooming right outside my front door. The bumblebees love Ceanothus, and on a sunny day, one can see several of them working the deep blue blooms. 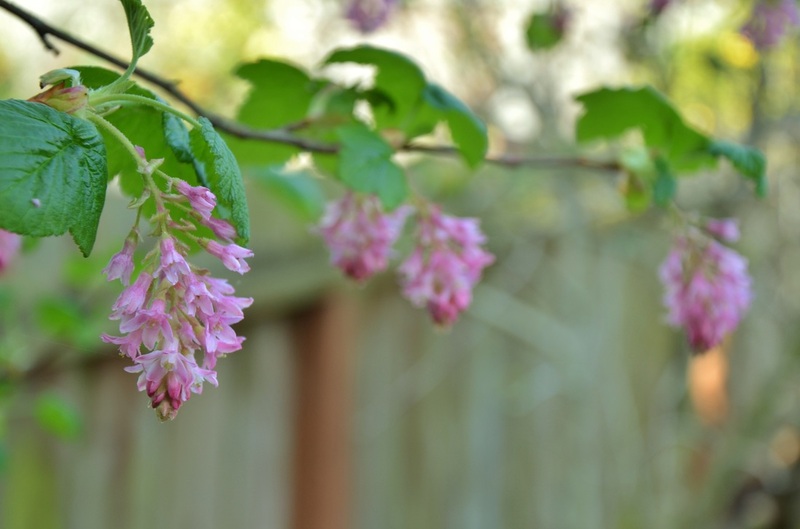 The fairest of all Early Spring blooms is the lovely Ribes sanguineum. It’s graceful plumes of pink flowers are truly lovely to behold. Right now, in many parts of the Bay Area, they are at their peak. Enjoy them while you can. Once the flowers have faded, they will produce currants that are loved by our local birds. Andrea Hurd, founder of Mariposa Gardening & Design.